wonderful mid-range , great deep bottom end and clean clear upper extension with big sound stage and great imaging ! Review Summary Sound "The much-vaunted smoothness of tube amplification is readily apparent with the M100 Plus"; but "the M100 Plus shows off a lower-end richness that initially seems inconsistent with its soft touch at the upper end" -- "it rocks." Features Tubed integrated amp that uses four EL34s to produce 40Wpc into 4 or 8 ohms; single-ended inputs only and no phono stage; remote volume control. Use "Don’t let the M100 Plus’s rated 40Wpc fool you" -- this integrated amp drove 87dB-sensitive ProAc Response Two S speakers with ease. Value "The M100 Plus competes very well with integrated amplifiers in its price range" where "sonic personality ultimately rules." Retro styling is the chic thing around town these days, from vintage-clothing shops to the PT Cruiser to the inexplicable success of That '70s Show. But what could be more retro than electronics that use vacuum tubes? Most of today’s mainstream consumers have never even seen tubes in action, so for many the thought alone is nearly as exciting as visiting Fred Flintstone and kicking around in his foot-powered buggy. However, to a segment of audiophiles, vacuum tubes aren’t retro at all. In fact, they never went away. Tubes are unapologetically analog, tangible in every way. You can warm your hands by them, space out to their cheery orange glow, and enjoy some high-fidelity sound to boot. Tube aficionados cite a warm, smooth sonic signature that tubes impart, or a "naturalness" that they allow to shine through, depending on which side of the audiophile fence you occupy. In contrast, solid-state gear is often accused of possessing harsh, grainy, or synthetic reproduction. The difference is often explained as one of distortion. All signal amplification creates distortion, or unintended frequencies, at an integer multiple of the original signal. The human ear has a difficult time hearing these byproducts when they occur at even multiples of the signal, especially a multiple of two. Tube-based amplifiers are purported to produce higher even-order harmonic distortion, rather than the odd-order distortion typical of solid-state electronics. Odd or even -- which are you? Opera Audio is a Chinese producer of high-end audio gear, their most popular items being the Consonance line of tube-based amplifiers and preamplifiers, although they also produce tube CD players and even a tuner. The M100 Plus, an integrated amplifier with a price of $1600 USD, represents the most successful of Opera’s budget, or M-Value series. The M100 model in particular has been through several generations in the past eight years from the original to the Mark II, the SE, and now the Plus, which features remote volume control. The M100 Plus delivers 40Wpc with user-selectable output of 4 or 8 ohms. It is a class-AB, push-pull design, which is said to be the sweet spot between efficiency and distortion. The class-AB operation keeps current flowing through the tubes even when idle, but only a small amount. Push-pull configuration is said to minimize second-order harmonic distortion, which, although it is typically perceived as a more benign kind, is nonetheless an amplification artifact. The M100 Plus accepts three input sources via RCA connectors only. There is no tape output, preamplifier output, or phono stage. One set of five-way binding posts for each channel are topped with thick metal lugs that are easy to grip and clamp down even onto thick spades. The unit accepts an IEC-style detachable power cord, measures 17 1/2" wide x 10 1/2" deep x 6" high (not counting the tubes), and weighs 45 pounds. It is flanked by wood-grain side pieces and has a brushed-steel base. Rising from the steel base, the tubes and power transformers stand up like silos on a busy farm. An included black steel cage can be positioned over the tubes for protection from curious meddlers such as, say, cats. The face is a model of minimalism, with only an on/off toggle, a blue power-indicator LED, and two identical-looking black rotary knobs -- one for input selection, the other for volume. The volume can also be controlled using the included remote, which is a small, square, and surprisingly heavy sculptural piece that consists only of a large circular button to raise and lower the volume. The volume knob on the unit’s face is not lighted, so you can’t see the relative volume position from a distance. The M100 Plus utilizes one pair of EL34 output tubes per channel. The four EL34 tubes are run in ultralinear mode, which drives the tubes with only a part of the output signal and claims to lower distortion. In addition, a pair each of 12AX7 and 6SN7 dual-triode tubes drive the input and driver stages respectively. The M100 Plus does not possess automatic or manual bias regulation, although the product manual takes pains to explain that small voltage differences between tubes do not cause any problems in the unit. 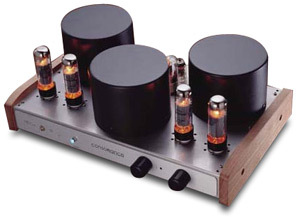 The Consonance M100 Plus was used in a system that has only known integrated amps. A pair of ProAc Response Two S speakers are the primary reference, normally driven by a Primare A20 70Wpc solid-state integrated amplifier. The Primare originally retailed at about the same price point as the M100 Plus, making for an apples-to-apples comparison in terms of price. Canare 4S8 speaker cables terminated with large spades at the amplifier and bare wire at the loudspeaker tether the two together, and DH Labs BL-1 interconnects connect a Marantz CD65SE CD player, Audio Harmony TWO harmonic filter, and the integrated amplifier. Although the ProAcs are designed to accept a biwire configuration, the design of the M100 Plus (with only one set of speaker outputs per channel) and past experience with the ProAcs suggest that single-wire configurations produce deeper bass response. The much-vaunted smoothness of tube amplification is readily apparent with the M100 Plus. Listening to Mary Jane Lamond’s often a cappella vocals on the crisply produced Celtic-language Suas e! [A&M 268842], I hear that her soft upper register sounds almost fluffy. On the second track, "Seinn o," it’s you and Mary Jane alone in the room. The edges around her voice are ever so soft, like the very slight defocus in a Polaroid picture versus the high-contrast edges in a digital snapshot. There's nothing harsh about this rendition, but I wonder if this degree of softness -- although downy and comforting -- is indeed completely accurate. I hear the same frictionless quality in Angie Hart’s voice on Frente’s Marvin the Album [Mammoth 923290-2], which has plenty of female vocals floating on top of midrange accompaniment, such as on the opening track "Girl," and of course "Labour of Love." Especially interesting is the closing track, a cover of New Order’s "Bizarre Love Triangle" that is recorded atypically harsh relative to the disc as a whole -- you can hear the background tape hiss quite clearly. Even on this grainy track, which borders on sibilant with integrated amplifiers such as the Primare, Angie Hart remains sweet-tempered as reproduced on the M100 Plus. Apologetic vocals aren’t reserved for women crooners alone. Mark Levinson Live Recordings at Red Rose Music Volume One [Red Rose Music RRM 01] features Bill Sims singing, on "Goin’ Back to Louisiana," with what sounds like a bad head cold. The man sounds stuffed up and, rather than let him call in a sick day, Mr. Levinson must’ve forced the poor guy into the studio. Good thing for us, because Mr. Sims’ malady illustrates the M100 Plus’s friendly inclinations. With other integrated amplifiers, I really feel for Bill -- he sounds as though he can barely breathe. Yet on the M100 Plus, the raging congestion becomes more of a runny nose -- sure, he still sounds sickly, but nothing he can’t work through. Something especially interesting happens when you turn to a track with action down below, in the bass line. Turning back to Mary Jane Lamond, the track "E Horo," presents a dichotomy: a groaning, grinding lower end contrasting against the buttery vocals. Here I notice that the low register has gobs of detail and isn’t shy around the edges at all. The groans are deep, and the grind is viscerally chunky. Turn back to Red Rose Music, "In a Sentimental Mood," where Chico Freeman’s tenor sax is so breathy and reedy that I'm glad I'm not in the front row. The detail throughout the low notes blowing through his wind instrument sounds nearly exaggerated, but perhaps it is just closely miked. When Mr. Levinson himself plucks away at his circa-1680 double bass on "Little Dog’s Day," the strings resonate with a surprising depth. The M100 Plus shows off a lower-end richness that initially seems inconsistent with its soft touch at the upper end. There aren’t many soft touches on Our Lady Peace’s Naveed [Sony EK80191], which is dramatic and serious rock with a heaviness that belies the band’s recent success with the modern rock-radio crowd. Tracks 3-5 comprise a trilogy of sorts, beginning with "Starseed," which descends from an acoustic foreshadowing into a sense of urgency with a rhythm section that propels the song forward, practically shoving it through to its end. Don’t let the M100 Plus’s rated 40Wpc fool you -- it rocks. Similarly, to dispel any beliefs that tubes are only meant to drive clean-cut and well-mannered music, the M100 Plus was all over System of a Down’s Toxicity [American CK62240]. "Chop Suey" is indicative of the band’s style: thrashy and littered with tempo changes and wild dynamics. The M100 Plus doesn’t shy away from any of these and in fact seems to embrace the dark side. Its politeness in the upper registers is absent in this forum, and the amplifier throws itself fully into the mosh pit. Even deep vocals, though, continue to receive the prim and proper treatment. Brad Roberts of the Crash Test Dummies sings about as deep as a man can without his larynx imploding. The man, who presumably drinks liquid testosterone with breakfast, is in fine form on "When I Go Out with Artists" from God Shuffled His Feet [Arista 74321-16531-2]. His lowest lows still sound surreal on the M100 Plus, but they lack that little bit extra that puts him into the freak-show category. Again, it seems to be a matter of detail at the edges. Fiona Apple is similarly affected. Whereas you can get away with the polite treatment for nice ladies like Mary Jane Lamond, Fiona isn’t such a bundle of cheer. She broods. Her husky voice thrives on as much secondhand smoke as it can get. On "Limp" from When the Pawn… [Epic EK69195] the M100 Plus’s two main character traits stand in relief: the piano line thumps with authority and petulant pounding, but Apple’s vocals are rounded off at the edges, lacking the detailed overtones that I earlier heard in Chico Freeman’s tenor sax. No one could accuse the M100 Plus of coming up short on personality. It lunges at bass and runs with dynamics and pace. The rhythm section is its best friend. At the upper end, the tubes become more polite and refined. Some will appreciate the M100 Plus's non-linear character as striking a good balance, and the integrated certainly lives up to the tube reputation of lacking any of the harshness or grain sometimes heard in solid-state gear. With its $1600 retail price, the M100 Plus compares closely with the Primare A20’s typical $1400 price tag. The Primare conveys a somewhat digital user interface, with its green LED and numeric volume display. In contrast, the M100 Plus stays truer to its ultra-analog aesthetic with an interface that is more form than function. Although the solid-state Primare features 70Wpc into 8 ohms, the M100 Plus never felt out-muscled. Indeed, the Response Two Ses with their 87dB sensitivity require a higher turn of the volume knob with the Primare to achieve a given level of output. Interestingly, the M100 Plus’s bass response reaches deeper to my ears than that of the Primare, lending more credence to the ProAc’s rated 27Hz low-end spec for the Two S. Rhythm sections lay a confident foundation when reproduced on the M100 Plus. Both integrated amplifiers have the speed to keep up with pace and dynamics without falling behind or feeling slow, and neither feels congested with material that is busy or complex. At the upper registers and especially with vocals, the integrated amplifiers differ in character. The Primare draws out detail and confers a dry, crisp quality where the M100 Plus softens the edges and dials back the detail a couple of notches. What is accuracy? High-resolution digital photographs, by comparison, often capture a surreal level of detail in their subjects, and the fine details are often so surprising because we usually miss them with our own eyes. Accuracy, in the sense of what is "really" there, versus naturalness, as what our senses tend to perceive, may not be one in the same. By these definitions, the M100 Plus favors naturalness; the Primare, accuracy. Tube components are somewhat of an acquired taste. They require a bit of care and feeding -- after all, vacuum tubes don’t last forever, and their performance will fade with time rather than simply fail in an instant. Locating replacement tubes can potentially be an issue, although the EL34s used by the M100 Plus are common. More importantly, the M100 Plus has a specific personality regardless of its technology: refined and smooth at the top, deep and lively at the bottom. As to value, the M100 Plus competes very well with integrated amplifiers in its price range; in this class, sonic personality ultimately rules. But if you like your bottoms heavy and your tops light, the M100 Plus warrants an audition.